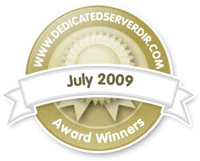 UK Web hosting Directory, DedicatedServerDirectory (www.dedicatedserverdir.co.uk) has announced that simplewebhosting.co.uk has been selected as the number one UK Reseller Web Hosting provider for the best performing company under this category. Caroline Paine from Dedicated Server Directory said that simplewebhosting.co.uk “. . . have been given top honours as the best Reseller Hosts around. They provide the best options and plans to make reselling web space easy and profitable and they excel in listening to the web developer in catering to the web developer’s needs to ensure long lasting relationships”. Dedicated Server Directory provides one-stop shopping for hosting services offering a neutral site for comparing and purchasing hosting products. Web Host Directory is the product of over 5 years hosting industry experience. As part of the Web Host Directory group of companies you are assured of concise accurate information and product offerings. This entry was posted on Thursday, July 2nd, 2009 at 3:46 pm	and is filed under awards. You can follow any responses to this entry through the RSS 2.0 feed. You can leave a response, or trackback from your own site.